Popular blogger and eminent classicist the Rev. 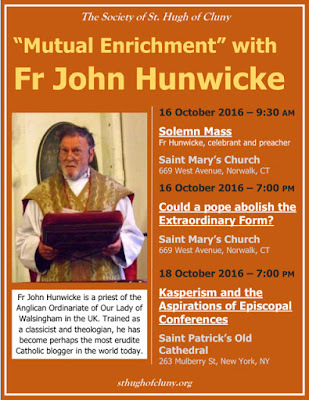 John Hunwicke is visiting the Northeast this weekend and into next week for two talks, sponsored by the St. Hugh of Cluny Society. Fr. Hunwicke will celebrate the 9:30 Solemn Mass (Extraordinary Form) at St. Mary’s Church in Norwalk, Connecticut on Sunday, October 16, and then give a talk in the school hall at 7 p.m, entitled, “Could A Pope Abolish the Extraordinary Form?” St. Mary’s is located at 669 West Avenue. He continues his visit on Tuesday, October 18, in Old St. Patrick’s Cathedral in New York City, discussing, “Kasperism and the Aspirations of Episcopal Conferences.” That talk is at 7 p.m.; the church is located at 263 Mulberry Street. Fr. Hunwicke is a priest of the Anglican Ordinariate of Our Lady of Walsingham in the United Kingdom. He is author of the popular blog, “Mutual Enrichment,” known for its pithiness and straightforward opinions on issues facing the Church. Those wishing more information can call St. Mary’s, (203) 688-5546, or go to www.sthughofcluny.org.